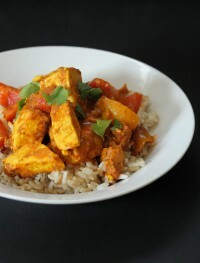 This paneer tikka masala is just awesome. The flavors are out of this world and the recipe not only is healthy but extremely delicious as well as versatile. This is my first time making paneer tikka masala or tikka masala for that matter. I am not going to lie, this recipe was quite involved because you had to make the gravy first as well as marinate the paneer and veggies and then broil the mixture before cooking in the gravy. 1. I have skipped the marinate and broiling steps of this recipe but left the pictures for your viewing pleasure. 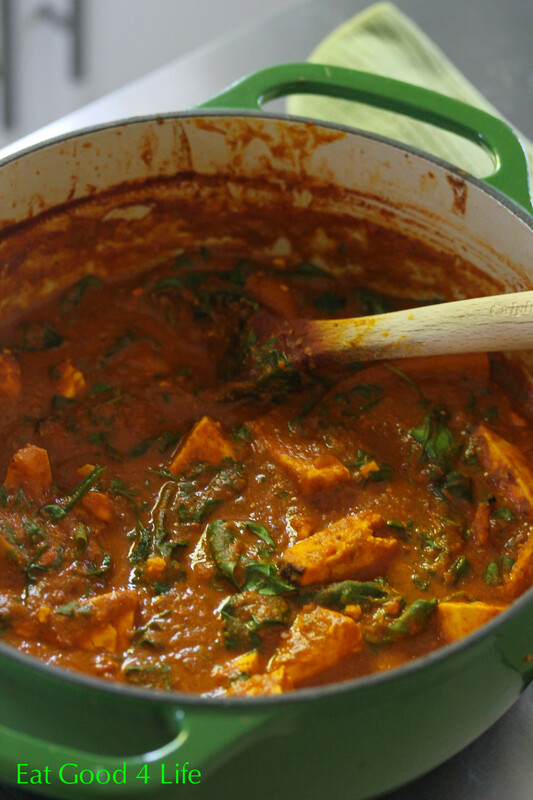 The results of this panner tikka masala are sill good without this two steps so enjoy. Since I made a lot of gravy, in my subsequent times making this paneer tikka masala, I skipped the broiling and marinating the paneer for a quicker version of it. It was still really good. I have tried both versions and each is perfectly delicious. Now don’t get on my case if I am not doing this recipe the traditional way. 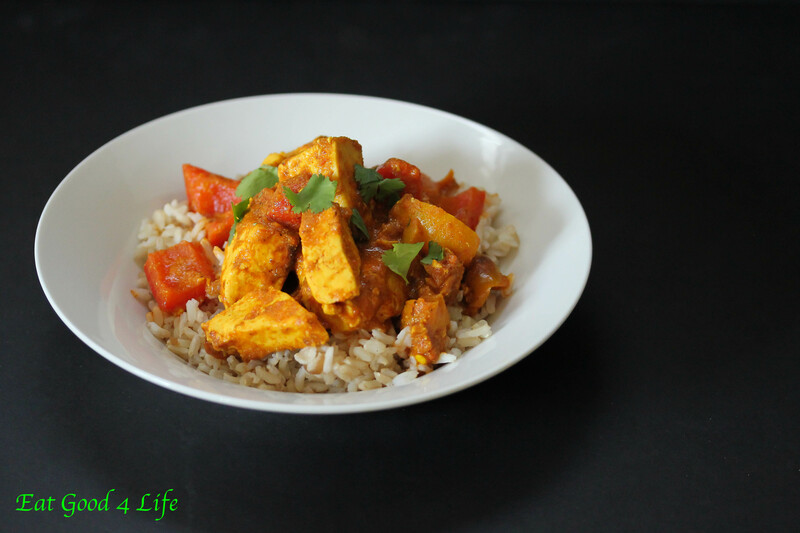 I have adapted the method for making this Tikka masala quicker to save time. This way when you are craving tikka masala it won’t take as long. You are more than welcome to keep the traditional method though but for me this works best. When you make the gravy keep in mind that it makes quite a bit. I used 4 mason jars and froze them for future use. It is so perfect, as I will be needing the gravy for future Tikka masala recipes. 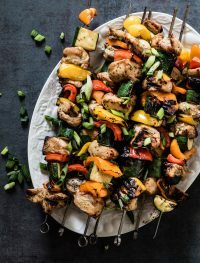 You can make this dish with chicken, which is the more traditional way, or even just used an assortment of veggies. Either way, this recipe is fantastic so I hope you get to make it soon. Trust me, you won’t be disappointed. For the gravy, place the oil in a 6 qt dutch oven over medium to low heat and add the marsala mix. Fry the spices stirring constantly until fragrant, about 1-2 minutes. Add the garlic and ginger and stir fry for 30 seconds or so. Add the onions, pepper and carrots and mix through with the spices. Let the veggies cook down for 3-5 minutes. Add the chopped tomatoes and water. Bring the mixture to a boil, lower the temperature to low, cover and let it simmer for 30 minutes. After the 30 minutes, turn the heat off and with an emersion blender blend the mixture until you obtain a homogeneous sauce. Cool down and store leftover masala gravy in mason jars in your freezer. 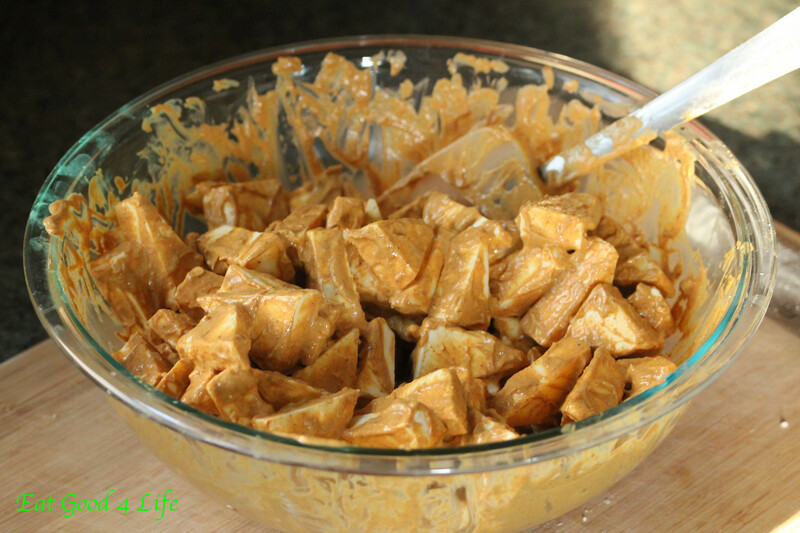 In a medium mixing bowl add the yogurt, milk, celtic salt, red chili powder, arrowroot powder and combine. Add the 3 cups of the gravy and incorporate well. 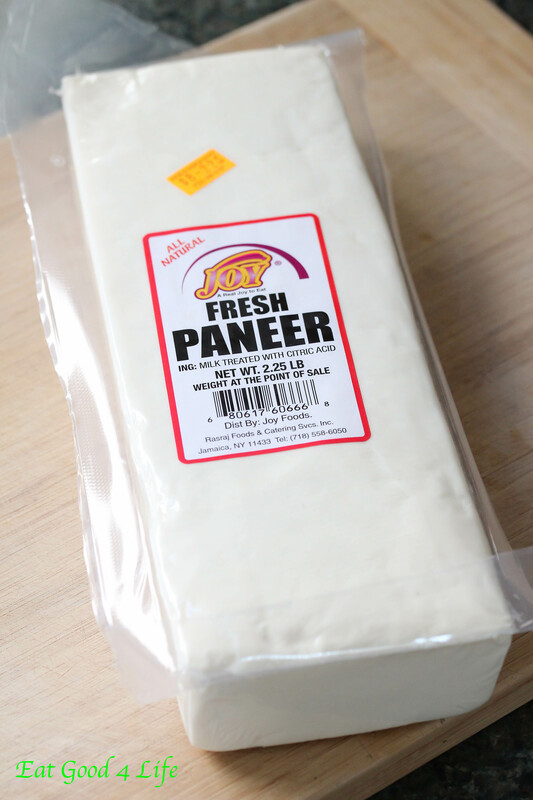 In a non-stick pan or a 3qt dutch oven place this mixture followed by the chopped paneer and pepper. Bring the mixture to a boil and lower the flame to medium low. Let the mixture cook for 15-20 minutes. Turn the flame off and sprinkle with the chopped coriander. Serve over brown rice. NOTE: You will have leftover gravy. Use mason jars and freeze for future consumption. Once your gravy is done this recipes takes a lot less time to prepare that is why I make extra masala gravy. Quick and delicious…a lovely meal! I made one small change by omitting the orange pepper and adding in a sliced onion. 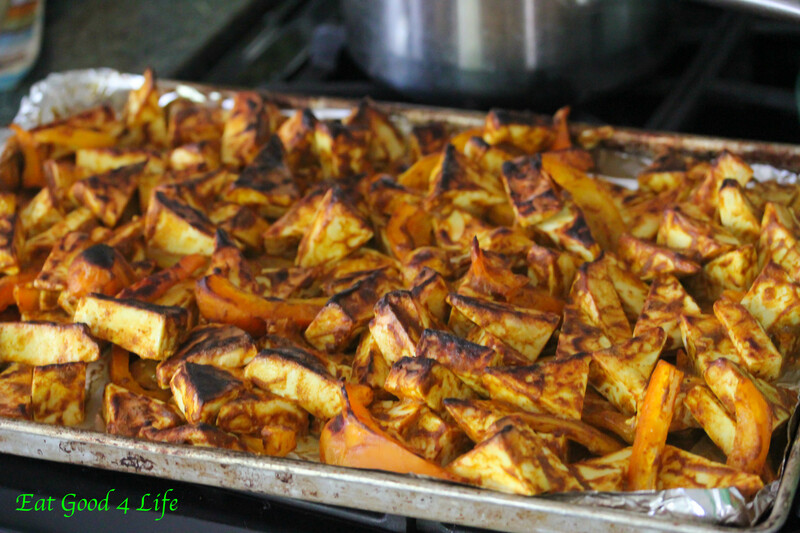 This dish was a huge hit with my family…really delicious. Thank you! I am glad everyone liked it :-) Thanks for stopping by. Hi. Instead of Rice wine vineger, is that any substitute? You can use any other white vinegar of choice. Thanks for stopping by. Hi, can I substitute unrefined sugar for white sugar? I just made this again for dinner as we have snow peas in abundance in our garden. This time I substituted ketchup with ground fresh chili paste by Hoy Fung Foods, Inc (in support for this company) and it was really good! I used my Fitday program and put the ingredients in with 5 servings and came up with 466 Calories per serving, 20 g fat, 3 Fiber, 46 g protein. I could take 48 more calories off per serving by using a non-stick skillet with a little skillet spay and leave out the olive oil. This is a nice quick ad easy recipe for all those snow peas. Can you substitute Apple Cider Vinegar for the White Vinegar or would it alter the taste too much? Less than 30 mins (including prep), and really yummy!! I added mushrooms and a few shakes of crushed red pepper – worth the try! Tried this tonight as a way to “clean” my fridge and use some veggies that I needed to get rid off – green pepper, white onion, mushrooms – and I’m so glad I did. This recipe is delicious! The hubby loved it too, he went back for seconds :) I omitted the corn starch, switched sugar for honey and used peanuts instead of cashews. This looks ridiculously good – can’t wait to give it a try! Pinned! 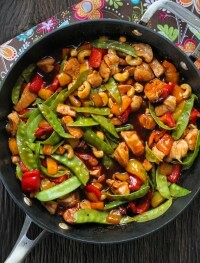 Kung Pao Chicken is one of my favorite dishes to order when eating out. I love your recipe and your photos are beautiful! Thanks for sharing. 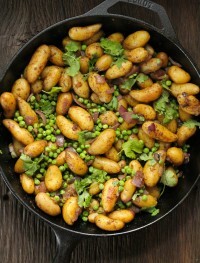 This sounds so good, definitely making this for dinner soon! Sodium content is very low, and saturated fat as well which is the bad fat. The other fats, polyunsaturated and monounsaturated are healthy. The dish already has a grade A so it is pretty good. If you like just use 1 tablespoon of olive oil instead of two and perhaps less chicken and more veggies. Rather than that I am not sure what else you can do. Thanks for stopping by! I hope you like it. I have noticed you use a WOK to cook with but put a link for a “large skillet” in the article. Is there a specific wok you use? I’ve had several that didn’t last, and want one I can actually hand down like my cast iron skillets. The one that I cooked this recipe in is actually the link for the skillet. I don’t have a wok. I have purchased two and had to throw them away both so I gave up. The link with the pan is actually the one I used :-) Sorry I can’t help you on the wok department! Miryam this is DELICIOUS!! My husband (born and raised in hong kong) said it tasted authentic!! I was so chuffed! I substituted rice vinegar for white wine as thats what i had in the cupboard, snow peas for sugar snap (none atm locally) and palm coconut sugar for the raw (again whats in my cupboard!) I also added 1.5tsp chilli flakes ( I assumed when you say pepper flakes you mean crushed chilli flakes?) and some garlic with the ginger as I have a ground paste! Your website is fast becoming my favourite! Thank you for sharing your passion with us! Great. I am glad you liked it. Your substitutions sound wonderful. Thanks for stopping by. Do you soak your cashews before cooking with them? I served this over quinoa instead of rice. Excellent recipe & so colorful, makes it that much more appetizing! Thank you!! made this tonight ” my family went crazy! I added a teaspoon of Sesame oil and it added more yuminess! We made this last night and it was very good. I cut the sugar in the sauce by half, and also added in fresh green beans, mushrooms and tofu. I doubled the batch, but 5 people gobbled most of it up. Very good! That is fantastic. I am glad it turned out good and that you guys liked it!! Thanks for stopping by. This is delicious and so easy! Served it over cauliflower rice. Yum!